There’s been a lot of discussion about media mentorship, especially with the popularity of Pokémon GO. How can libraries help families and children learn how to make smart and safe media decisions? Last week, librarians from across the country joined Chip Donohue, Tamara Kaldor and I for the webinar, Media Mentorship and Family Engagement in the Digital Age. 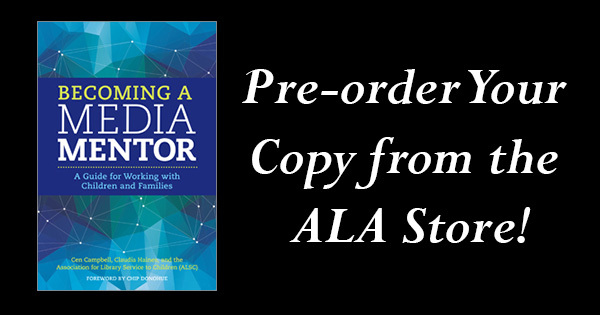 Media mentorship and family engagement in the library are perfect partners. Bringing together the early childhood expertise and the librarian perspective, we highlighted how library staff can use the two approaches to support families. Librarians are lifelong learners, experienced researchers, and excellent communicators. We can use these skills to meet families where they are and connect them with the information they need, in the format they want. 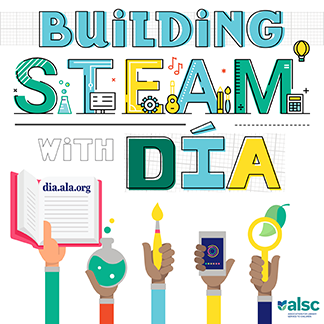 ALSC members can view the archived webinar, which was hosted by the Erikson Center for free. Slides from the webinar can also be downloaded. If you have questions about media mentorship and family engagement in the library, feel free to contact Claudia Haines @claudiahaines, Chip Donohue @chipdono and Tamara Kaldor @chiplaypro. Claudia Haines is the Youth Services Librarian at the Homer Public Library (Alaska). 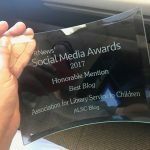 She designs and leads programs for young people ages eighteen and under and their families, provides community outreach, and manages the library’s children and teen collections. She is the co-author of Becoming a Media Mentor. Did Anyone Get Burnt This Summer?